We don’t have an iPhone but this was taken almost by me on my new iPawd mini. Since it’s now the end of September, I’d thought I’d share my Facebook Selfies from last month. Actually, this blog has been sitting in draft for three weeks cos something kept coming up like a real blog post. Even though I don’t blog on Sunday’s, I like to show my support for Kitties Blue by participating in their Blog Hop. Remember, you don’t have to be on FB to view my page but if you’re not, you can’t comment or like a post. You can get all color iPhones and iPhone cases and this kitty likes a variety. Of course, if I had to tell the truth under oath, neither TW nor myself has a smart phone of any type. This was a good one. HHGutt had stolen TW’s phone and used up all the battery on selfies of himself. The nerve of some stuffies! On this next one I couldn’t decide which to use so I figured four selfies were better than one especially since they were so stunning. Did you pick your fave? 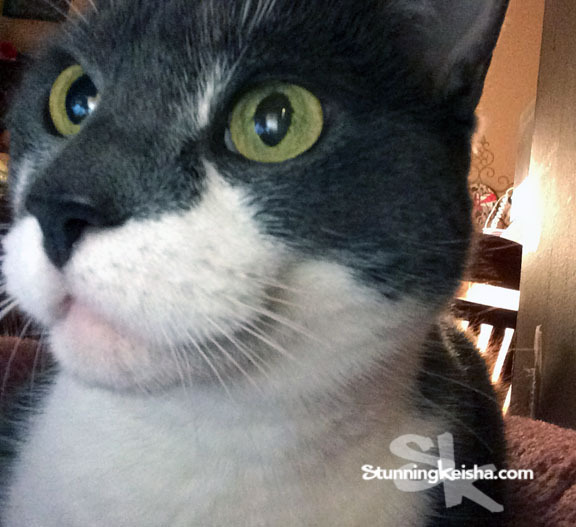 I’m participating in the Sunday Selfies Blog Hop hosted by Kitties Blue. What’s better than 1 selfie? 4 all new selfies. Do you have a fave? Check out this one! TW caught me snapping the pic so I was prolly telling her to get lost. It’s #SundaySelfie time and I’m prepared! TW says I talk too much and I’m talking back to her while I’m taking my #selfie. This one was really popular cos everyone liked the pink kitty case. It is cute. Here’s one of my faves. I’m on my Tree of Pain looking a bit sassy. These are great and make ours look like poop. We love the four is better than one, because we can't get enough of you! Both you and HHGutt are very good at taking selfies. You have such creative selfies, CK! Your selfies are always terrific and we love the photo on the blog today!!! We need to take selfie lessons! You take the best selfies, CK! Regarding that whole smart phone thing... Glogirly has one, but it has NOT made her any smarter. Nice selfies!!!! You´re so handsome! THOSE are all fabulous CK!!! We luv all yous selfiies CK. And we luv da cat fone cover. Dat's purretty cool. Altho' weez not have a snart fone eever. MOL Have a gweat day. You always take a great selfie CK. I don't have a smart phone either :( Where do you get your iPhone templates? All your selfies are beautiful. How could they not be! CK, you're really great at this selfie stuff. Stunningly creative! Those are all great selfies, CK. Good job. Darling, I am so embarrassed by my Human's ignorance earlier about Yogi. She's a Philistine! CK, Glogirly's right, smart phones do not make the humans any smarter! However, your selfies are pretty darned good! In fact I could say (and I will say) that they make you look even stunninger if that were possible! BTW the woofie thing at my place is getting a bit worrying. I have heard human talk about how it would be nice to have a real one!!!!!!?????? I think I might have to approach NUCAT for an intervention!! Haha, HHGutt is so naughty :-) Your selfies are stunning, and I love the pink kitty case! You are beautiful my friend. That picture of you on the ipawd is wonderful....you're even smiling!